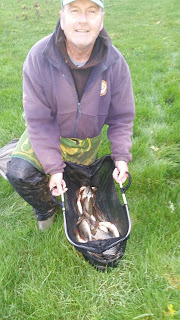 With loads of rain on Friday and Saturday morning, the river was bank high and unfishable so we were out the pond today and after last weeks disaster it would be nice just to put some fish in the net. Today was supposed to be a V.E.S. Precision match but Rob said it would be rescheduled to one of the free dates where hopefully we’d be able to fish the river. Draw time arrived and as always I fancied a peg on the road side but pulled out peg 2 where I was in the last match here. The forecast was pretty dire for today with showers and gusty winds expected, we got to the pond and the level was up and it was quite coloured but not as muddy as I thought it was going to be. There were loads of fish topping and with it still being exceptionally mild for November, I thought it would fish well today. Rigs for today were a 1 gram Drennan Tipo for fishing on the deck and a little Preston Chianti for fishing up in the water, both had 0.10mm bottoms and size 18 B611’s. 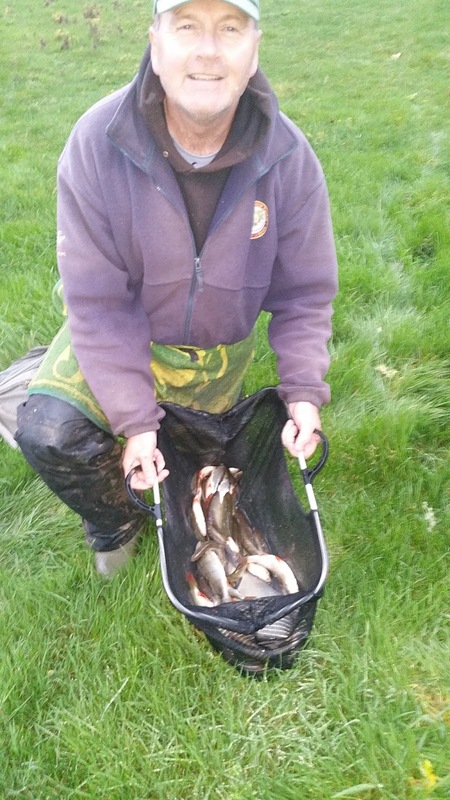 For bait I had casters, maggots, hemp and Bait-Tech Pro Nat Dark groundbait. The only anglers I could really see were Jake Woodard on 19 and Rob on 20, I could just about see Heardy on 22 if I leaned forward on my box. On the whistle I cupped in two balls of groundbait at 10 metres before starting with double red maggot on the hook and had a small roach first chuck. 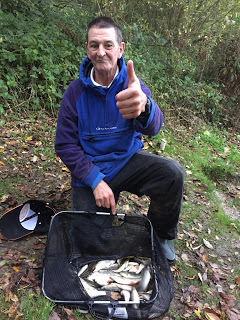 I stuck a caster on and carried on catching small roach but did have a couple of nice rudd and after an hour I had 32 fish for probably 2.5lb. 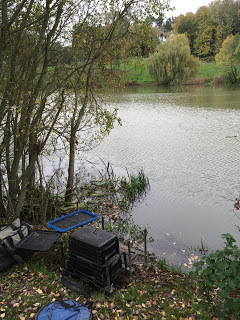 Jake was fishing the feeder and I’d only seen him net one skimmer and Rob was swapping between the feeder and pole and only getting odd fish so at this early stage I felt I was doing okay. The second hour carried on in the same vein but I was getting quite a few fish on the drop so it was time to try the shallow rig, first chuck I had a decent roach and carried on catching quite well with the average stamp bigger than the fish I was catching on the deep rig. 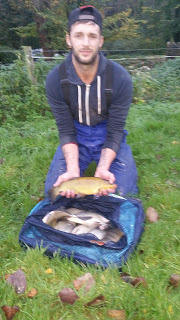 By the end of the second sixty minutes, my clicker was reading 59 fish and I reckoned I had around 5lb, Jake had added a nice 2lb tench and an eel but I thought I was still just ahead. I couldn’t really see what anybody else was doing but Hurf turned up for a walk round and said none of the anglers on my left were really bagging up. 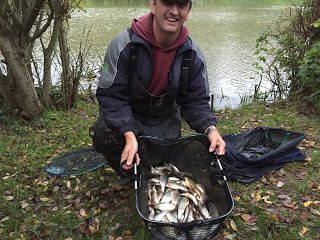 Things started to slow up during the third hour and missed bites became a problem once again, changing depths and moving shot around would result in a fish or two but I only added another 20 fish although I did have some cracking roach with a couple around the 12oz mark. Jake on the other hand was now flying, he was catching skimmers regularly and even added a big perch for good measure. The blustery wind was also increasing in strength and making presentation a nightmare at times. I tried the deep rig again and had a couple of fish but I was having to wait too long for bites so it was back to the shallow rig and missing lots of bites! I started feeding another line at 10 metres and swapping between the two which seemed to help and I’ve had some more good roach. With about an hour to go it was obvious there was only going to be one winner as Jake was still catching skimmers and it was looking like he was going to do a good weight. Scott Jackson came for a wander and said Big Frank on peg 7 had caught a slab and some skimmers on the feeder but nobody else was admitting to much. 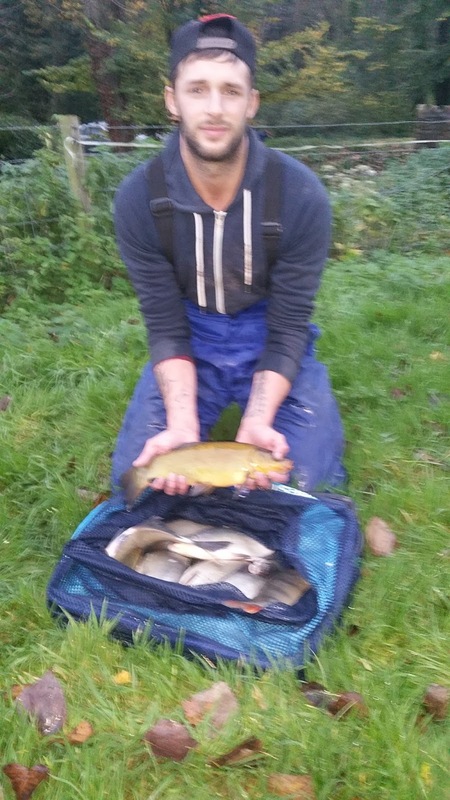 Rob called the all out and I finished up with 123 fish which I hoped would give me double figures, I knew Jake had probably won the match but I wasn’t sure how Heardy had fared, I did hear him cussing when he lost a bream late on. 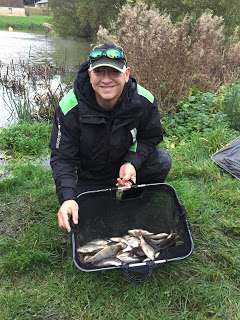 I packed up and walked round to get some photos of the weigh in, we started with Karl on peg 14, he’d struggled for 6oz but at least he was still smiling! 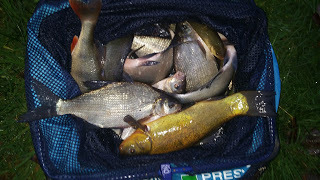 Then Steve Parker had 5lb 14oz next door which included some lovely roach. Karl had struggled but at least he was still smiling! Then we got to Frank and his bream and skimmers pulled the needle round to 10lb 14oz and I thought it might be tight between us. Fieldy was only admitting to 3lb and said he’d be last on the pond but nobody was surprised when he actually weighed 6lb 7oz! We reached my peg and when I pulled my net out, I still thought it would be close between me and Frank, he was on the scales and called my weight at 13lb, so I’d won the section at least. 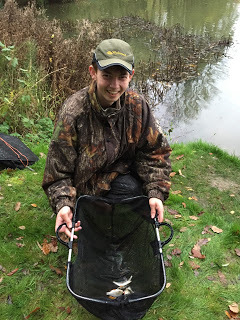 We loaded the cars and drove round the other side for the results, as expected Jake had the top weight with a lovely net of fish weighing 24lb 7oz, all on the feeder with pinkies on the hook. Heardy had the next best weight on that side with 11lb 8oz, which meant I’d finished second on the day and picked up £30 which was very welcome after a bad run over the last few weeks (and it was nice to get a pound back from Steve P as well). Rob had 2lb 7oz which was enough to take the section money by double default and Gordon had struggled by the pumphouse for 13oz. *thanks to Rob Cox for the photos. 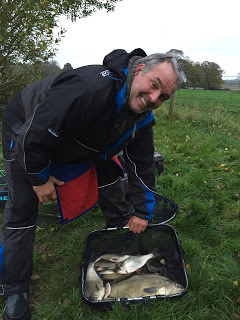 A really enjoyable day with plenty of bites and some quality roach and rudd, it’s certainly an intriguing venue and it will be interesting to see how it fishes as it gets colder. This weeks ‘The Big Fish’ on BBC2 was the best one yet, they were in Canada and the scenery was stunning but the fishing was even better, the first two tasks were fishing for salmon and trout which saw some nice fish landed but in the final challenge they were after the mighty white sturgeon and what an amazing fish! They all caught some massive fish with several approaching seven feet long and even Ben Fogle got in on the act. Dan hooked a large sturgeon and had it beat only for the leader to give way as the fish was near the bank, understandably gutted, he got back in the boat and landed the next one. The only women left, Jo, hooked a huge fish and had a titanic battle which she was just about winning when the hook straightened, she was in tears and knew she needed that fish to stay in the competition, it was the right decision that she went home. It’s the final next week and they are headed to Zambia and it hopefully it will be a cracker.